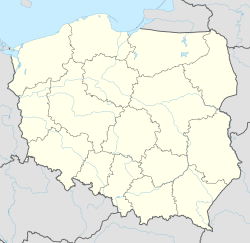 Klępsk [klɛmpsk] (German: Klemzig) is a village in the administrative district of Gmina Sulechów, within Zielona Góra County, Lubusz Voivodeship, in western Poland. It lies approximately 8 kilometres (5 mi) east of Sulechów and 23 km (14 mi) north-east of Zielona Góra. The formerly Old Lutheran church of Klępsk, since 1947 in use by the Catholic Church in Poland. The village has an approximate population of 560. Until 1945, the village Klemzig was part of the New March within the province of Brandenburg, Germany. In the 19th century the village, then known under its German name of Klemzig and part of the kingdom of Prussia, was a center of the Old Lutheran movement, whose members refused to join the state-sponsored Prussian Union (Evangelical Christian Church) and suffered persecution. Some of the Klemzig Old Lutherans immigrated to Australia where they founded the village of Klemzig, South Australia. This page was last edited on 23 March 2017, at 00:58 (UTC).